Yellow Transparent is an old Russian apple variety, quite widely grown in the northern states, and also in Europe (where, confusingly, it is known as White Transparent). Yellow Transparent has two notable qualities. It ripens very early - often as early as the third week of July even in the northern states. Secondly, it is exceptionally cold-hardy, and capable of surviving winters in zone 3. It is therefore easy to see why Yellow Transparent became a popular variety in North America as the settlers moved west. Yellow Transparent can be eaten fresh when fully ripe, but is primarily an apple for the kitchen, where it easily cooks down to a light apple sauce with a good flavor. For cooking it is best to pick the apples slightly green. Perrine Yellow Transparent is a sport (natural bud mutation) of the original form, and is unusual for being a "tetraploid" variety - it has double the number of chromosomes of the original ("diploid") form. The extra chromosomes are thought to be responsible for its better fruit size and the slightly larger and more vigorous tree size. 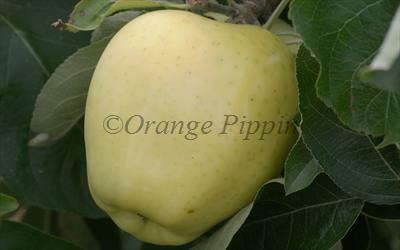 Fill in the details below and we will let you know when Yellow Transparent apple trees are back in stock. Yellow Transparent has exceptional cold-hardiness, and has long been popular in the northern states for this reason. In these areas it is also considered a good disease-resistant tree. However it is very susceptible to fireblight, so is not a good choice for areas where this disease is prevalent. It is probably also a good idea to choose fireblight-resistant rootstocks where possible. This aside, its natural vigour seems to help it shrug off most other problems. The other horticultural issue is that Yellow Transparent can lapse into biennial bearing - fruiting only every other year. This seems to be associated with its natural tendency to over-crop, and this is definitely a variety that repays thinning of the fruitlets as they start to swell after the blossom. The Perrine Yellow Transparent is generally considered to be slightly more disease-resistant than the original form. Yellow Transparent originates from Russia and is probably a very old variety. It was widely grown throughout Europe in the 19th century, and also became popular in North America. In Europe it is most commonly known as White Transparent, and confusingly, another variety - Transparente de Croncels - is more commonly known as Yellow Transparent. Perrine Yellow Transparent was found by D.B. Perrine in an orchard in Centralia, Illinois, in the 1930s. It is effectively an "improved" Yellow Transparent.